On team Well+Good, we’re all about dedication to healthy eating—but that doesn’t mean we don’t get the busy-girl struggle (not everyone has hours to spend meal prepping when they have studio openings and barre classes to attend). 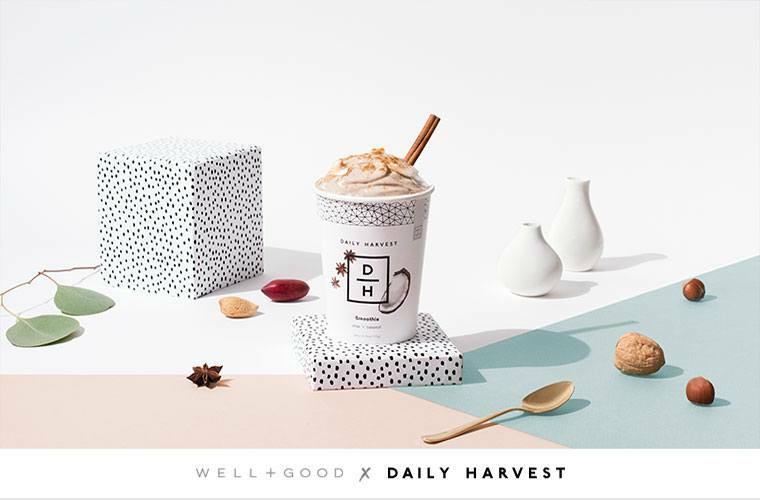 That’s why we teamed up with Daily Harvest, the frozen superfood delivery service, for The Well+Good Edit, our curated collection of (seriously creative!) W+G-approved meals. In each box you’ll get a mix of smoothies, soups, overnight oats, chia parfaits, and healthy sundaes (because #yas)—all loaded with organic ingredients and buzzy superfoods like turmeric and adaptogenic mushrooms. All you have to do is pour the frozen ingredients from each cup into a blender or pot, and you can whip up a nutritious meal faster than you can say takeout. In each box you’ll get a mix of smoothies, soups, overnight oats, chia parfaits, and healthy sundaes (because #yas). In the spirit of the holiday (and hygge) season, we chose recipes like simmering miso soup and pumpkin chai oats to warm and nourish you from the inside out. And with delivery service that arrives right at your door, you can skip the frigid grocery-store trip and go straight to the satisfying dinner (or breakfast, or after-Netflix snack). PS: The standard box includes nine Daily Harvest ready-to-make dishes, but if you already have the 12 or 24-cup subscription you’ll be getting even more Well+Good selects. Oh, and with code WELLANDGOOD, you’ll snag a three-cup discount (so that box of nine will cost you the price of six). Score! Scroll down to see the 9 superfood-packed goods we picked. You’ll get to to sip (and Instagram) this gem before anyone else. On top of creamy coconut, it’s also got the smoothie ingredient of the year (cauliflower, duh) plus a sweet kick with chai spices. Get it while it’s…cold. Because Well+Good’s favorite fruit is avocado (obvi), this creamy, greens-packed smoothie (that tastes like chocolate pudding) was a no-brainer. Organic zucchini brings the fiber, while raw pumpkin seeds and organic pea protein make it the perfect post-workout sip. Bonus: When you grab the Well+Good box, your swag includes a keychain declaring, “I believe in avocado.” Because don’t we all? When you’re craving comfort food, this warming soup will hit the spot while also providing potential immunity-boosting, stress-relieving, anti-inflammatory perks. Filled with veggies such as parsnip and asparagus and wonder-spice turmeric, consider it a nutrient-loaded upgrade from your standard chicken noodle. While everyone else is guzzling their PSL’s, get your (healthier) pumpkin fix with these overnight oats. Warming spices like cinnamon, ginger, and cardamom give the dish its chai flavor, while pumpkin gives you a mega-dose of betacarotene and vitamin A. A lighter twist on the classic potato version, this brothy stew is filled with digestion-supporting goodness thanks to fiber-filled cauliflower, onion, and leeks. Plus, you’ll score a fix of hard-to-get vitamin K, which supports healthy heart and bones. Who says wellness pros don’t eat dessert? The secret ingredient of this nutrient-dense treat is sweet potato, which coupled with magnesium-rich dates provides just enough sweetness to contrast the salty crunch of pumpkin seeds and Himalayan pink sea salt. Trust us, you’ll want to marry it. Your usual golden milk latte just got better. This bowl puts a tropical twist on the turmeric bev, combining the anti-inflammatory spice with pineapple and mango for a vitamin-rich breakfast. Psst: Your digestive system will also score an assist from chia seeds and pineapple’s enzymes. This fan-fave blend gets its Instagram-worthy hue from organic spinach and chlorella, a powerful detoxifier. Meanwhile, cashew butter ups the decadence factor, while cacao and peppermint oil deliver calming properties. Who knew drinking a smoothie could double as a meditation sesh? This is definitely not the dollar ramen you ate in college. Daily Harvest’s revamped version is filled with yummy butternut squash noodles and packed with adaptogenic mushrooms. With reishi for immunity, cordyceps for detoxification, and chaga for antioxidants, this is basically the soup version of your favorite wellness tincture. Grab your a nine-cup box for the price of six with the code WELLANDGOOD!